Faced with the problem of poor air quality, City of Cincinnati Fleet Service personnel set forth to reduce greenhouse gas emissions in city fleet vehicles, while saving taxpayer dollars along the way. Nearly 10,500 fewer gallons of gasoline per year by switching to propane autogas. Approximately 40,000 less pounds of carbon dioxide emissions each year. $1.06 per gallon average savings with propane autogas over gasoline. In 2010, the City of Cincinnati felt a shift guaranteed to push ‘status quo’ out the door. Andrew Glenn, director of public services, was committed to cleaning up the air around the city. He envisioned a sustainable fleet of service vehicles for the city that would reduce the municipality’s dependence on foreign oil, while shrinking their overall carbon footprint. Part of this vision was motivated by the mayor’s “Climate Protection Action Plan: The Green Cincinnati Plan.” The proposal included the procurement of additional alternative fuel fleet vehicles to reduce harmful emissions. Glenn and his team were not alone in their quest for fresh air. Their local Clean Cities Coalition, Clean Fuels Ohio, introduced city officials to propane autogas, offering expert advice and guidance about the alternative fuel. Clean Fuels Ohio helped the city receive a grant to deploy propane autogas vehicles to add to the city’s existing mix of E-85, electric and hybrid vehicles. “Propane autogas’ benefits are three-fold,” said Andrew Conley, Clean Fuels Ohio’s program director. “It offers economic and environmental benefits, along with an ease of transition due to it being a readily available fuel source. 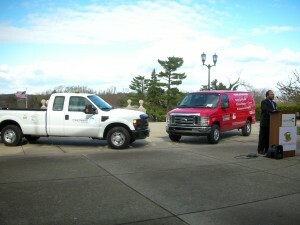 The ROUSH CleanTech propane autogas trucks, which included six Ford F-350’s, seven Ford F-250’s, and one Ford F-350 outfitted with a dump bed, were purchased from an authorized Ford dealership, Valley Ford Truck, Inc., with assistance from an Energy Department grant obtained through Clean Fuels Ohio. 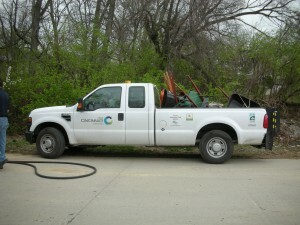 The trucks were assigned to the Cincinnati Park Board, Public Services and The Greater Cincinnati Water Works. According to Maraskeshia Smith, deputy director of City of Cincinnati’s Department of Public Works, the city estimated that substituting their conventional fuel with propane autogas would remove nearly 10,500 gallons of gasoline from utilization each year. Firm numbers will be reviewed once the ROUSH CleanTech vehicles have had a year of running time. Studies show that propane autogas burns cleaner than gasoline or diesel, with 20 percent less nitrogen oxide, up to 60 percent less carbon monoxide, up to 24 percent fewer greenhouse gas emissions, and fewer particulate emissions when compared to gasoline. Additionally, when compared to gasoline, propane autogas yields 87 percent less smog-producing hydrocarbons and 50 percent fewer toxins and other smog-producing emissions. According to Smith, ROUSH CleanTech’s system was chosen not just for environmental and economic benefits, but also because it was a dedicated system that offered Ford’s factory warranty. “We have our own mechanics working on the vehicles at our facilities,” she said, adding that the city has installed two 1,000-gallon fueling stations to keep these vehicles fueled and ready to work. The city worked with their local Ferrellgas propane distributor to install two on-site propane autogas stations. The savings to the city is significant, considering the average price they pay for propane autogas is $2.16, while the average price of their gasoline is $3.22 per gallon. Initially, personnel had concerns about performance in extreme weather conditions. After completing a winter with the trucks in use, Barbara Neumann, administrative specialist for City of Cincinnati Fleet Services, reports that they’ve had no problems with cold-weather starting. In fact, the vehicles had no problems starting or running in any weather condition. The City of Cincinnati is finding the benefits of propane autogas taking root in their communities. As their mission to bring a greener tomorrow to their citizens grows, they plan to add more propane autogas vehicles, including five Ford E-250 cargo vans and three Ford E-350 vans with 15-passenger seating capacity — all designed to run clean. And as the network of propane autogas fueling infrastructure continues to develop across the nation, it is their hope that more city, state and national fleets will adopt propane autogas into their lineup of clean fuel options. About ROUSH CleanTech: Based in Livonia, Mich., ROUSH CleanTech offers dedicated liquid propane autogas fuel systems for a variety of light- and medium-duty Ford vans and trucks, and for the Blue Bird Propane-Powered Vision and Micro Bird G5 school bus. Currently offered through authorized Ford dealerships around the country, the ROUSH CleanTech propane autogas fuel system delivers the same factory Ford performance characteristics and serviceability with a 5-year / 60,000-mile limited warranty. Customers can lower operating costs significantly while reducing vehicle emissions. Complete details on ROUSH CleanTech propane autogas offerings can be found online at ROUSHcleantech.com or by calling 800.59.ROUSH.